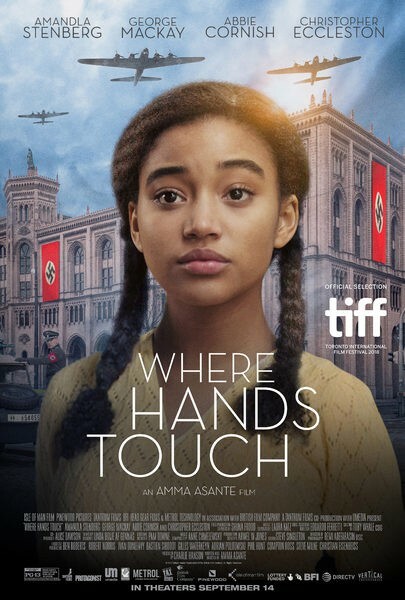 Where Hands Touch is a coming of age story set in the most brutal of times: Germany, 1944. Leyna (Amandla Stenberg), the 15-year old daughter of a white German mother (Abbie Cornish) and a black African father, meets Lutz (George MacKay), a compassionate member of the Hitler Youth whose father (Christopher Eccleston) is a prominent Nazi solider, and they form an unlikely connection in this quickly changing world. As Leynaâ€™s mother strives to protect her from the horrors that she could face as a mixed-race German citizen, Leyna is forced to forge her own path as the war goes on and the Naziâ€™s increase their atrocities over the Jews and all dissidents. Can she find an ally in Lutz, himself battling a fate laid out before him that he is hesitant to embrace?